SCLT are professional Farm Slurry Lagoon Liners contractors. 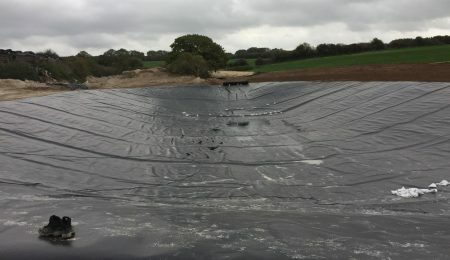 We have over 20 years experience in the geomembrane lining industry providing Farm Slurry Lagoon Liners UK wide to many of our farming and agricultural clients. Being heavily involved in the installation of slurry lagoons for many farms across the UK and Ireland. Give us a call if you would like to discuss any of your potential lining projects further or would just like some advice on how to progress your lining project. We have been working closely and helping farmers for years comply with the Nitrate Pollution Prevention Regulations that find themselves within the nitrate vulnerable zone. This means farmers have to provide additional slurry storage for up to six months of the year for their agricultural waste. Complying with SSAFO regulations the England and Wales and SEPA regulations for Scotland we’ve installed lining solutions for many farm slurry stores. In addition, all of our lining and materials come with an installation warranty that is guaranteed for 25 years on all of our projects. Please some of our more recent Slurry Pit liners projects at the bottom of this page. Slurry lagoon liners are mainly used in farms so that agricultural waste can be successfully contained within the lagoon without leakage into the local environment. Call us if you are looking for a Slurry Lagoon Construction project to be implemented on your farm. We have been working closely and helping farmers for years comply with the Nitrate Pollution Prevention Regulations that find themselves within the nitrate vulnerable zone. This means farmers have to provide additional slurry storage for up to six months of the year for their agricultural waste. Complying with SSAFO regulations the England and Wales and SEPA regulations for Scotland we’ve installed lining solutions for many farm slurry stores. In addition, all of our lining and materials come with an installation warranty that are guaranteed for 25 years on all of our projects. Please some of our more recent Slurry Pit liners projects at the bottom of this page. There are many regulations and environment agency guidelines in place regarding the appropriate storage of agricultural waste. This depends on where you are situated in the country. We ensure that all of our lining membranes that we supply and fit comply with the Environmental Agency guidelines whether these are SEPA guidelines for Scotland or SSAFO for England. We will also provide a fully qualified and experienced installation team to fabricate the lining project on site. More details on our welding and fabrication qualifications can be seen on our site or by request. High density polyethylene geomembranes (HDPE) provide a strong water tight barrier against both solids and liquids. Waste such as manure from beef, dairy, poultry, chicken and duck farmers is the most common type of waste stored in a Slurry Lagoon. Extra benefits in addition include having excellent UV resistance, impermeability, high yield and weld strength. You can rest assured out lagoon liners will withstand both extreme hot and cold weather conditions throughout the summer and winter months. As Farm Slurry Lagoon Liner experts, when we install Lagoon Lining High Density Polyethylene (HDPE), its vitally important that the ground, soil type and condition should be considered. This is because an additional geotextile underlay may need to be provided to protect the HDPE Liner against sharp rocks and stones that could damage and penetrate the membrane.This will be more beneficial to extend the life and duration of the chosen membrane. If you would like to discuss your project regarding lagoon liners and see how we can help, then please give us a call. One of our representatives will be available to assist with your slurry lagoon construction project. For a competitive quote on your project please give us a call on 07800654682 to discuss your requirements or fill in the form below. Give us a call no matter where your location is as we supply Farm Slurry Lagoon Liners UK wide and overseas.